Mermaid Cakes are so fun! Mermaids are always a popular party theme. 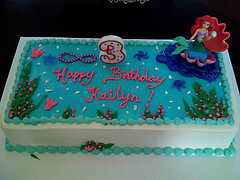 Whether it be mermaids in general, or the Little Mermaid, or as part of a bigger theme such as Peter Pan or Under the Sea, you may find that a mermaid themed birthday cake design may be a great decorating option or you. For a mermaid theme cake, you can make a rectangular sheet cake (or any shape you wish, really), and cover with blue icing on the top for water. In one corner, make a “mound” or “hill” out of cake, frost in chocolate to look like a rock, and stick an inexpensive Barbie type doll with flowing red hair into this. Draw a mermaid tail on the "rock" with green icing. You can also make an ocean cake, with a mermaid swimming in the ocean. If planning kids birthday cakes for a Peter Pan party, include a pirate ship too! Because cakes with a mermaid theme are so popular, there are plenty of choices available for items to purchase thru our Amazon Affiliate Link below. From cake pans, to cake toppers, to mermaid candles or figurines, you'll easily find the perfect item to help you create fun cake designs.